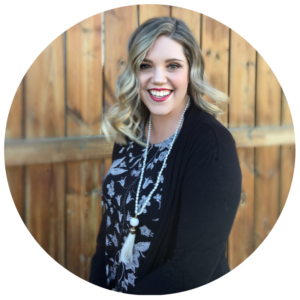 We all get stuck in a rut sometimes, and it’s easy to overlook things in our own homes. 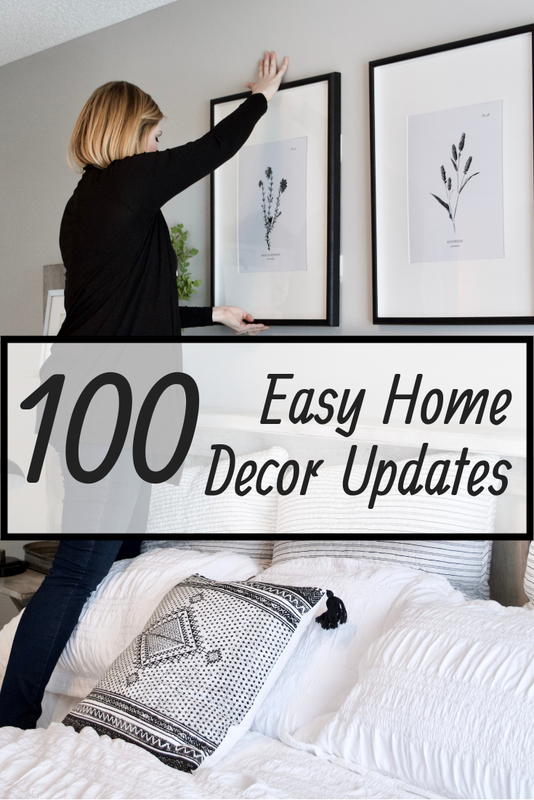 Here are 100 simple updates, changes or improvements you can make to breathe new life into your house! 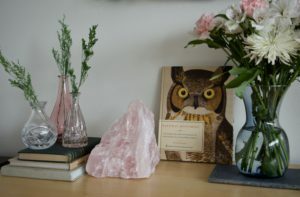 Fresh flowers on your coffee table, bedside table or dining table (or all three!) will instantly elevate your space. Upgrade your hangers so they all match. I’m a fan of wood hangers in the front closet and space saving non-slip hangers in bedroom closets. Dry clean or replace your curtains. It’s amazing the difference a new colour or pattern can make in a room! Buy a set of brand new, matching tea towels. Paint a brick fireplace. I know I’m pushing “easy” a little here, but it can be done in a day and it’s so much cheaper and easier than refacing a fireplace. At the very least it’s easy for the huge impact it will make! Minimize the clutter on your kitchen counters by putting away or purging underused appliances. Hire a carpet cleaner. If you’re thinking that means you have to move furniture etc, you don’t! A quick clean of your area rugs, stairs, hallways and other high traffic areas will make a bigger difference than you think, no furniture moving required! Add planters on either side of your top steps, at your front door. Evergreen shrubs or annuals are great options. While we’re outside, give your front door a fresh coat of paint, or a good wipe down. Add a wreath for instant curb appeal. This is a good one, especially if you like seasonal decor! Replace the mats at your entrances when they start to look stained or worn, or spray them down to clean them. I usually check mine in the spring and fall. Clean your windows, inside and out! If you don’t want to pay a window washer, you can purchase cleaning solutions like this that attach to your garden hose at your local hardware store. Instant view upgrade! Add a plant to an empty corner, window sill or bathroom counter. Make your bed! If you already make your bed in the morning, take it up a notch with a pretty new throw blanket draped over the end of the bed. Replace your throw cushion inserts with these gorgeous down-filled ones that are on my Christmas list! 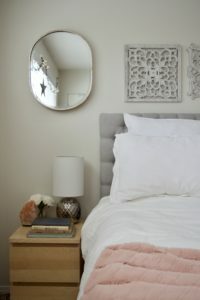 Add a large plush area rug underneath your bed, or sheepskins on either side to make getting out of bed in the morning a little more pleasant. Speaking of cozy, stack some logs beside your fireplace in a basket or log holder. Switch out the side table by your favourite chair. You can pick something fun and trendy, or shop your house for something you already have. Add a small stack of books from your “to read” list, and a coaster for your tea or coffee. Replace your lampshades! Lampshades get dirty, dusty and discoloured over time and a new shade will freshen things up without breaking the bank. Swap old or boring handles or pulls out for new ones. Whether it’s a dresser, bathroom vanity, side table or your whole kitchen, changing the hardware can give you a whole new vibe! Change out dated or mismatched outlet and light switch covers. These things are SO cheap (literally pennies each) and easy to replace. If yours aren’t current, put this on the top of your list! Put a cute little rug in front of your kitchen sink. Make sure its washable and add non-slip underlay; it’s an easy way to add some colour and texture in room that’s not always terribly cozy. 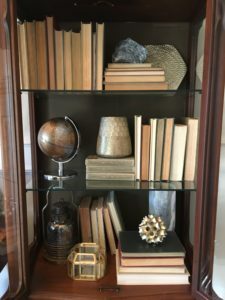 Display a previously stowed away collection or move it to a new spot. This works best if your collection is edited and curated- you can always switch out items from time to time. I collect brass candle holders, and have them displayed on oak picture ledges in my bedroom. I love seeing them when I wake up in the morning! Upgrade the pillows in the guest room (I recommend 2 medium-firm and 2 soft so guests can choose) if you haven’t before. Change up a bookcase by organizing by colour for more impact or by turning them so the pages face out to soften the impact. Walk through your home and take stock of your wall decor. Do you still love it all? If not, take measurements, note them in your phone, and keep your eyes peeled when you’re shopping. Ideally, wall art should be at least 2/3-3/4 of the width of the furniture below it or of the wall. While you’re at it- is your art hung at 57″ from the floor to the centre of the art? That’s industry standard, but hanging it too high is a common mistake. There are always exceptions, but it’s helpful rule of thumb to keep in mind. Give kids’ stuffed animals (or dog toys!) a home by hanging a basket with handles on a wall hook in a handy spot. Clear off the tops of your kitchen cabinets to reduce visual “noise”. Update or upgrade frames that you’ve had for a long time, if they no longer suit your style. It’s easy to overlook dated or tired photo frames! Add a decorative tray, dish, or box to your nightstand to collect change, hair elastics or other little bits that always seem to collect at a bedside. Corral out of control cords with command hooks. Behind my tv, I have the power strip stuck with 3m velcro hangers, and command hooks to hold various cords that have been wrapped and clipped with binder clips. Replace dried or faux plants that have seen better days. If you have sun fading or dust build up that you can’t remedy, replace them! Clear off the front of your fridge. It easy to look past all the things you’ve put on over the years, but it definitely adds to things feeling cluttered. I stick pictures etc on the side of my fridge, where I can still see them, but they aren’t a focal point. If you have wire shelving, create a wood overlay. This is a good tutorial. Paint your stair risers. You can add a pop of colour or use a stencil to add pattern. 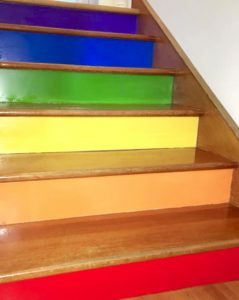 I’m a huge fan of these rainbow stairs that we painted in a client’s house, and it only took about 90 minutes. Use sample sized paint jars and it will only cost you $4-5 a stair! Add a super cozy throw blanket to your favourite seat in the house, or the seat where your guests sit most often. 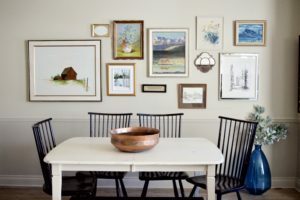 Install a gallery wall in your hallway. If the idea of a gallery wall overwhelms you, you can’t go wrong with matching frames, in a grid layout, and black and white photos. Remember the 57″ rule! Replace a light fixture! If you have copper wiring, there are plenty of tutorials online that make this doable for a newb, or call a pro if you’re unsure. Entry, dining room, and kitchen island lights are usually focal points, so start with those spots. Use nice baskets in your laundry room to hold smaller bottles of cleaning supplies to reduce the look of clutter. Rearrange your bookshelves with the rule of 3/5 in mind. Odd numbered groupings nearly always look better than even groupings. Style your coffee table. If you have a bare coffee table, add a little decor to make the room feel luxe and carefully considered. A tray, large coffee table books, candles, flowers, vases and interesting objects will help you create something beautiful and interesting. When was the last time you replaced your bath towels? Hand towels? If they’re showing their age, replace them, especially in the most frequently used bathrooms. Hang a new shower curtain. While you’re at it you can replace the shower curtain rings if needed. Add a new fabric or texture to a room you’d like to make cozier. A chunky knit throw, velvet cushions, burlap wrapped vase, silk sheets, linen curtains, woven baskets, leather seating- mixing and layering various textures helps make a space feel homey and well collected. Add a tablecloth with bold colour or interesting pattern before your next family dinner. Place candles in powder rooms and light them before guests arrive. I prefer unscented soy wax or beeswax candles. Purchase a large pedestal bowl (or 3!) to get your fruit off the kitchen counter. Paint a little. Painting a small wall, a cozy reading nook, the end of a hallway or the back of a bookcase a fun, bold colour can go a long way. You could also paint the backing of a built in or bookcase, or the frame of a mirror. One of the awesome things about painting something little is that it allows you to be bold without much risk. If it doesn’t look right, you can just pick another colour and paint over it! Drape an interesting throw blanket or piece of amazing fabric over your headboard in the cooler months to make it feel warm and cozy. If you have Ikea furniture, upgrade the slipcover! Ikea frequently brings in new fabrics for their most popular items, and there are online retailers who make Ikea-sized slipcovers in amazing fabrics, such as Bemz. Speaking of layers, swap out single curtain rods for doubles, and layer sheers and heavier curtains. Add at least one natural element of some kind in each room. Dried greens, seashells, raw wood, geodes and other treasures from nature warm up a space and make it more inviting. If your boxspring is exposed, and you’re not the bedskirt type, a simple fitted sheet over the boxspring takes things from first apartment drab to chic with hardly any effort. Add wall hooks anywhere you frequently find items on the floor. This is especially helpful in kids’ rooms! If your child is under 8 or so, hang them as high as they can reach so they’re not too low once they hit their next growth spurt. If they’re older than 7-8ish, hang it at that usual 57″ from floor to centre. Use family pieces to add charm. Place your dad’s old camera on a bookcase, an antique chair by the door, or your great grandfathers magnifying glass on a stack of books to add a personal touch. If you have open shelving in your kitchen, display your favourite dishes, or a collection. Even something as simple as rows of coordinating glassware or clear vases can look curated and sophisticated. 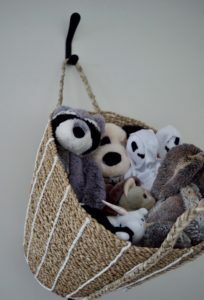 Add a large basket in your living room with lots of rolled throw blankets for family and friends. Add lighting. The more lamps, sconces, candles and dimmer switches you have, the more control you have over the mood of a room. Whiten tile grout with a whitening pen. Re-caulk your sinks and around your tub or shower to make things look new and fresh in just a few minutes time. Change or spray paint your house numbers. Ideally, they will coordinate well with the siding they’re placed on but contrast enough to make your home easier for guests or emergency services to find when they’re looking for you. Add a tree swing. There are so many ready made and DIY options! All you need is a tree with a branch that’s at least 6″ in diameter. Try rearranging your furniture. Pull seating away from walls, and don’t be afraid to place some pieces floating in a room. Ask a friend to help if you think you might need fresh eyes! Change out the centrepiece on your dining table. You could use that pedestal bowl full of lemons, an eclectic mix of candle holders all in the same finish, or fresh flowers or dried greenery from your garden. Look around your home at what you already have, and try it out! Have an empty corner that you’re not sure what to do with? Add a super tall vase (or a group of 3! ), towering stacks of books or a blanket ladder to display fave quilts. Add a bench at the end of your bed. Pick a statement piece, find something with storage, or use it as an opportunity to add pattern of texture. Line your dresser drawers with fun wallpaper. Dark room or hallway? Try replacing light bulbs with a higher wattage bulbs. If you have a broken or underused fireplace, arrange a group of block candles in various heights and sizes inside the firebox. Do you have a spot that’s feeling a little drab? Pick a colour that will coordinate with the existing decor and add 3-7 items in the new colour. A book with a spine in the right colour, throw cushion covers, a blanket, plant pot or art with a new accent colour can help bring in some new life. Switch out or paint furniture legs. A can or two of spray paint can liven up your couches, sideboard, tv stand or bench quickly and easily. There are lots of metallic finish options, or pick a fun colour! You can also find replacement legs at pretty pegs.com, on Etsy, or at your local hardware store. Add chair cushions or toss small sheepskin rugs over dining chairs, dining benches, or bar stools. Add herbs or potted plants in matching pots to your kitchen’s windowsill. Place a washable tray or small box beside your stove to contain the bottles of oil and spices that always seem to collect there. I like these from H&M. Add a runner to your dining table to dress it up a little without the fuss of a table cloth. Are things feeling a little heavy or closed in? Open up some floor space by removing a few pieces of furniture, or moving decorative accents such as vases off the floor. Go thrifting! Spend an afternoon browsing thrift stores, flea markets, kijiji/craigslist or antique shops, and bring home a new-to-you treasure or two. An interesting old object can be a great conversation piece, especially if you can get the story, or do a little research on the piece. 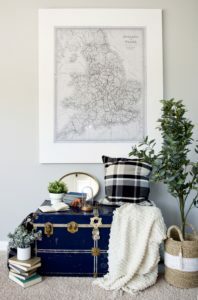 I recently picked up a trunk from an older couple and they told me all about it’s travels from England to Canada- you just can’t beat the feeling of knowing the history of a beautiful piece! Mix your metal finishes. Pick 2-3 metallic finishes and add several pieces in each finish throughout the room for a sophisticated, high-end look. Have a piece of furniture that just doesn’t really go with your decor any more? Paint it! Add a mirror to open up a space and reflect light around a room. Lean one on a console table or dresser, or hang one at the end of a hallway. Edit. Have a shelf or cabinet that hasn’t been re-styled for a while? Remove a few object and see how it looks with less, or take everything off the shelf and start from scratch. Books are an easy to use accessory and look good nearly everywhere. Add towers of books on the floor beside a reading chair, under a side table, on or under your coffee table, or on your bedside table. 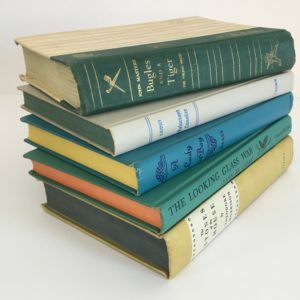 Stick to books with covers or spines that are in the same colour palette to make sure it works and take off the dust jackets if it looks better. Thrift stores are great place to buy load of books on the cheap. Switch out dated closet doors. Add a bold rug, in the right size. The general rule of thumb is that an area rug should be large enough that *at least* the front legs of each piece of furniture in a grouping rest on the rug. Change out your builder grade kitchen faucet and ditch the bottle of dish soap for a pretty dispenser. Swap out vinyl roller blinds for roman shades, bamboo blinds or curtains. Hang plug-in pendant lights, or add plug-in wall sconces instead of traditional table lamps in tight spaces or anywhere you’d like to make a statement. 3m makes great clear cord clips that you can use to keep the cord flat against the wall. Style your bathroom counter. Display soap and cotton balls etc in decorative glass jars, or add a plant and a few candles. Upgrade or spray paint tried and dated floor vents. If you have a frameless mirror in your bathroom, add a frame, or replace the mirror for a quick and easy upgrade. Use rug or carpet underlay to make an inexpensive or thin area rug feel extra squishy. Mulch your flower beds annually. Even if you’re a total black thumb like me, it will make your garden look 100x better, with only a few minutes of work while keeping weeds at bay. Hang your curtains high and wide of the window to make the room look bigger and the ceilings higher. Add black. Most designers will tell you that every room needs at least a touch of black. Whether you’re going for light and airy or dramatic, black will help grout the space and add contrast. Phew! You made it through the whole list. What’s next on your list? Tell me in the comments below!